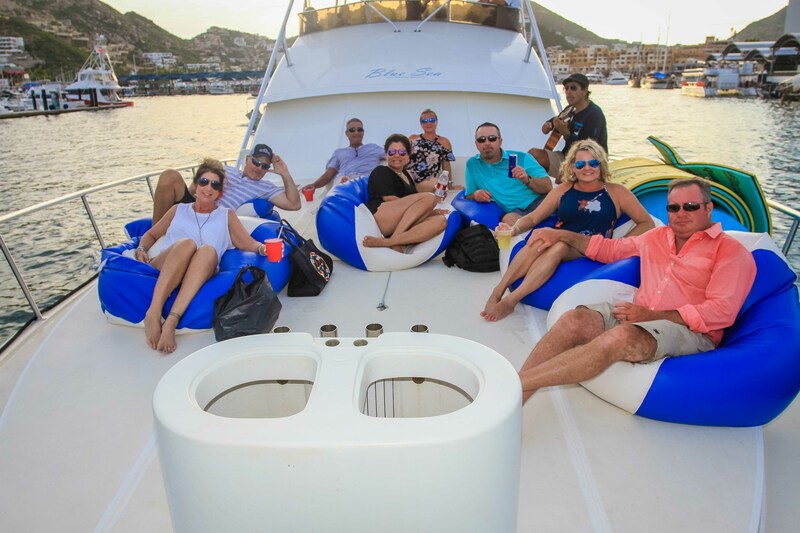 Blue Sky Cabo is pleased to provide a promotional discounted rate to float and party or snorkel near the Cabo San Lucas Marina. The two areas are Pelican Rock and Mango Deck – all charters include a visit to the ARCH. 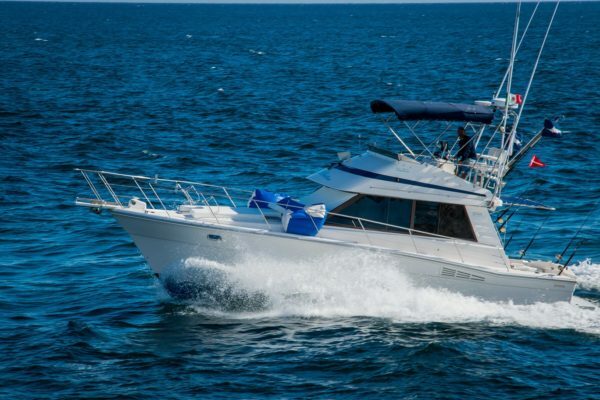 This is a bare boat package – clients are invited to bring their own food and beverage – complimentary photography is offered. *Pricing is bare boat – BYOB – or $20, $25, and $30 Per Person Open Bar Fee. *Pricing includes snorkel gear, lily pad, floating island – water toys. *Pricing excludes $10 per hour bartender fee on 43 Foot and 60 Foot Yachts. *Pricing excludes suggested gratuity and federal tax 16%. *Complimentary Photos Provided – Suggested Photographer Gratuity – $40. *Optional Open Bar Available – 4 People – Each Additional Guest – $40. Package includes water toys, lilypad, floating islands, SUP paddleboard, and snorkel gear. Package excludes optional bait for Pancho The Sea Lion – $50 (Total). This is a float contract in Medano Bay – no cruising. My wife and I have had such an amazing time in Cabo and it is largely in part to Jim and the rest of his crew at Blue Sky Cabo. We watched the most beautiful sunset aboard Blue Sea on Tuesday evening. On Wednesday we went on an 8 hour fishing charter aboard Blue Water with Captain Eddy and Roberto where we caught a 103” Striped Marlin! On our way back into the marina we even got to feed Poncho on the back of the boat. I would highly recommend booking the Drone service with Diego for an amazing way to document your trip. 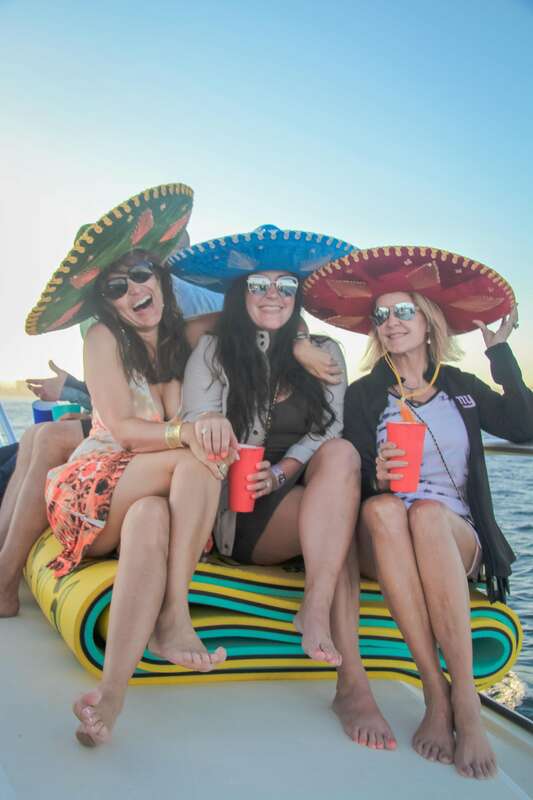 We can’t wait for our Party Float at Mango Deck aboard Blue Water because there is no doubt in my mind that it will be just as amazing as our previous Blue Sky Cabo activities. If you’re coming to Cabo you have to contact Jim because he has an activity to suite everyone, and his level of customer service is unmatched! Another great time on a Blue Sky Yacht. Myself and a couple friends and their friends had a great floatparty. We had 14 of us and the blow up flamingo and Lilly Pads are the best to hang out on in the water and have cocktails, beers and of course water too. Haha great time and good memories created again. Thanks Blue Sky Cabo !!! We spent a few hours on the Blue Sky for a float party. The trip was awesome! It’s a wonderful boat with a fabulous crew. Plenty of space, and the up-close views of the arch were wonderful. Well done! SO MUCH FUN AND DEFINITELY WORTH IT! We just did a party float last week after the new year. We had 15 of our closest friends and family members on the boat. We were blown away. The staff was fun and amazing! They took photos, made cocktails, and had fresh appetizers and food made for us. There was unlimited alcohol, and it was good alcohol too! In the past we have used other companies for boats when we have come to Cabo and nothing has even come close to comparing to our experience with Blue Sky. They had so many floaty options, let us jump and flip of the boat, and were not stingy when it came to alcohol! They also had bluetooth and let us play our own music, which made it even better! I would definitely recommend this company to my friends and when I come back, I will definitely be using them again!!! Thanks Blue Sky 🙂 See you next year!!! My family booked with Jim and Theresa for a sunset cruise but they recommended since we have kids ages 7 to 15 they would enjoy the float party more. He was right! Blue sky was perfect in size for our group and his crew is always nice and accommodating. We brought our own snacks and drinks. They have a large cooler with plenty of ice. The use of water toys is a nice touch, they offered to put out the floating island but we declined since the lily pad was enough for the kids. It was full sun so the littles took cover in the cabin and played games. Our teens loved the matress on the bow of the boat, thought they were pretty special on snap chat and instagram. To top it off on the way back to the marina we got a couple of “pancho” visits too!! Great day on the water with blue sky and crew. Can’t wait till Oct…adults only! We had the best time on our Float and Snorkel we wish we started our trip with this unforgettable adventure! The crew was on time and ready, coolers filled with ice and beverages, all set to take us by the pretty rocks of Cabo San Lucas to enjoy the crystal clear ocean. They set up a Huge lily pad float, inflated a huge island float, our kids snorkeled to see beautiful tropical fish as we went from float to float. We would recommend this trip to everyone. Blue Sky Cabo Float Party! Went here for a bachelorette party and we had an amazing time! The boat crew were all extremely friendly and accommodating. The view was lovely and the experience itself is amazing. Would definitely recommend to others. We started our voyage relaxing with pictures and taking in the fresh air. Also got to see a number of adorable seals. Then ended a little bit off the shore with music and tequila! The crew are all very attentive and will really let the group decide what we wanted to do. Our afternoon enjoying this float party was by far one of the highlights of our trip to Cabo. 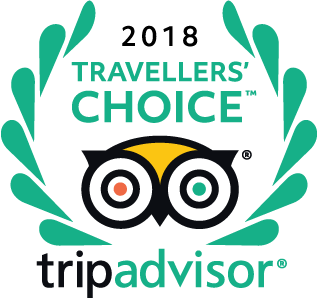 We were a group of thirteen (teenagers, young adults, older adults) that had a fantastic time enjoying some sightseeing, viewing sea-lions sunning themselves, and playing around in the water and on flotation equipment provided by Blue Sky. We were even treated to the thrill of having some sea lions come onto the back of the boat for a photo opportunity and some fish. The boat crew were extremely friendly and enjoyable to interact with, and fluent in both Spanish and English. The boat was beautiful, clean, and very comfortable. When you wanted to take a break from the heat and sun, you could go rest and relax in the cabin. Would definitely be on the top of my list of “to do” activities if I had the opportunity to return to Cabo. We took our family and friends out. Very accomodating, incredible staff, above and beyond service. As one who fishes offshore, I would not hesitate using Blue Sky for those services as well. Highly recommended. For a fay on the water, sunset cruises, or fishing Blue Sky has it all. We used this charter cruise to cruise to the arches, sight see, swim, snorkel and the kiddos used the lily Pad. The staff were outstanding and kind. They were knowledgeable and provided great entertainment to our kids of all ages. Went down to Cabo with a group of guys and had a fantastic time on the boat. The crew was doing whatever they could to help us have a great time, I would recommend Blue Sky to anyone who is looking to party with a group. They had floats and snorkels for us to enjoy in the cove. 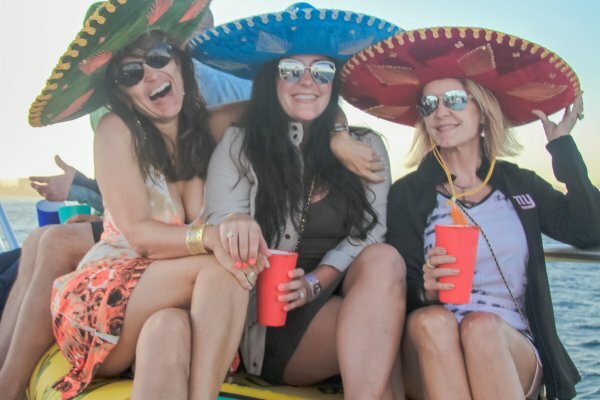 We took a ride with Blue Sky Cabo for a bachelorette with 8 girls. 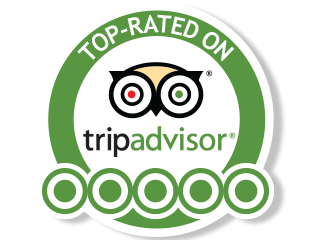 It was so relaxing, fun, and the staff went above and beyond our expectations. The endless shots of tequila followed by a visit to the famous arch, then parking the boat to float on a gigantic unicorn they blew up for us, was such a blast. We were able to jump in and cool off in the water, another boat parked next to us came over to join our party, and we all shared good times. I was able to rent a jet ski right from our boat! One of our girlfriends got extremely sea sick so they arranged a pick up for her, which was nice and convenient. I would definitely recommend Blue Sky Cabo as a MUST DO experience when in Cabo. There are also tons of bars in the area for after the trip, such as Senor Frog. The crew was fabulous, they helped us take lots of photos, and we shared many laughs and memories all around. We went on a trip for a bachelorette party and went through Blue Sky Cabo for a private boat ride. The crew was so accommodating! We had an open bar and they always made sure we always had enough alcohol and served us drinks. We went around the ocean for a bit and we were able to anchor in the middle and they provided huge floats including a giant inflatable unicorn that fit over 10 people! The crew would give us our privacy when needed but also made sure to entertain us when we wanted it as well. They are hilarious and such a great group to give us a tour! I will definitely go back to them again!!! Blue Sky Cabo was the highlight of our trip. The crew was wonderfully helpful, charismatic and we enjoyed their company. We took a tour of El Arco and went snorkeling. From there, we anchored up at Mango Deck and enjoyed the lounge rafts and had a blast. An unforgettable experience and heck of a way to enjoy a daytime bachelor party. I am looking forward to reminiscing at the wedding! Talk about the highlight of our entire trip! If you are looking for a good time, the sunset cruise is a must do to kick off your night. The crew made our cruise one to remember with plenty of drinks, photo opportunities, music selection and activities. We got to feed “Poncho”, the friendly sea lion that hopped on the back of our boat, float in the water, sunbathe on the front of the deck and dance the evening away. The boat was in excellent, clean condition with plenty of room to spread out. Would recommend to anyone for a girls trip or bachelorette party! We did the party boat cruise for my friend’s bachelorette party. It was definitely an experience to see the arches then we docked and got to swim in the ocean and hang out on floats. It was a fun day, the crew was accommodating. Amazing Adventure! Trip Highlight! Must Do! Customize your activities! This was an amazing day trip for our group. The staff was so much fun and the service was entertaining. We had a float/sunset party and spent time jumping off the boat and relaxing in the water! The Captain let us play our own music and the staff made amazing drinks and appetizers. We even enjoyed tuna that the crew caught it the morning! Next year we plan on reserving the crew for a fishing trip. If you are going to Cabo do not miss this activity. You can go to the arch, snorkeling, whale watching, fishing. These guys are very popular, so make sure you reserve in advance. We reserved the same day we bought our plane tickets, but it’s never too late to call and ask if they have an opening. Fun for all ages and the more the merrier! We were a group that had teens all the way up but I would feel comfortable bringing younger ones too. Thank You Blue Sky Cabo! See you next year. 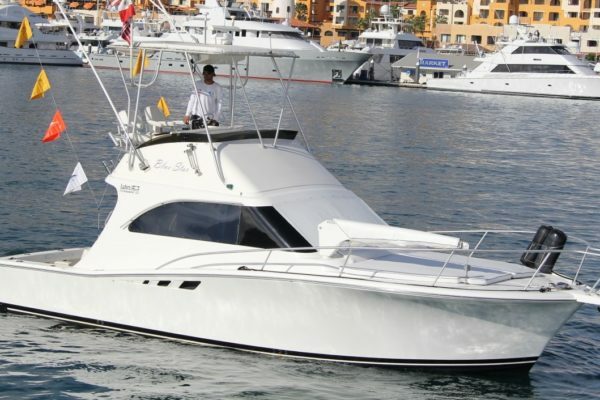 Just wished to leave a complementary review on my time spent with blue sky cabo aboard their 60ft Bertram, Blue Sea. Both days we were accompanied by the same crew, who were everything plus more. Friendly, informative and professional in every manner. Day one we spent cruising the immediate are, taking in the views of the arch then swimming in the beautiful crystal clear waters. Day 2 started early… around 6 am. Same smiling crew, ready to roll. We were met with light breakfast, drinks and even a complimentary waitress. Fishing started within a hour and immediate reel squeels were heard. Bought to the deck was a variety of Bonita, mahi, and tuna. After a good while we pushed to deeper waters to target larger pelagic species especially marlin. Around 10 we were served breakfast and a while later we were served the tuna we had landed a few hours ago right of the bone. Complimentary beers and other beverages were served throughout the day. The day ended not landing what we were targeting, but that’s fishing however it was a great day. 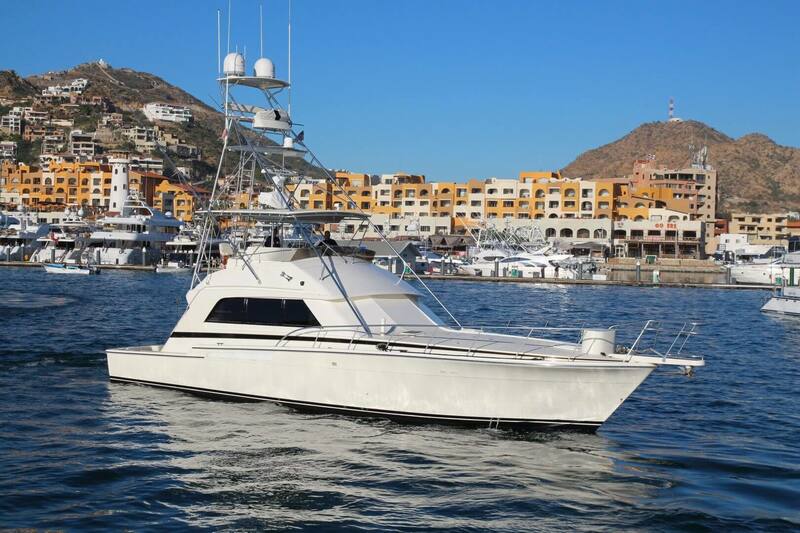 I’d highly recommend Blue sky cabo for any of your boating adventures, and my next trip to Los cabos I will definetly be back, no questions. On a end note is like to thank the crew Captain Leonel , Gilbert, Julio and Diego. We booked a half day float. Saw El Arco & went snorkeling by Pelican Rock and hung out there for a while. After that went to Mango Deck beach & had a great time! The crew was great, boat was fantastic and could not have asked for a better time. There were 13 of us for Bachelor party on the boat and had no space issues and there was not a single person that had a bad time. Would recommend to anyone. 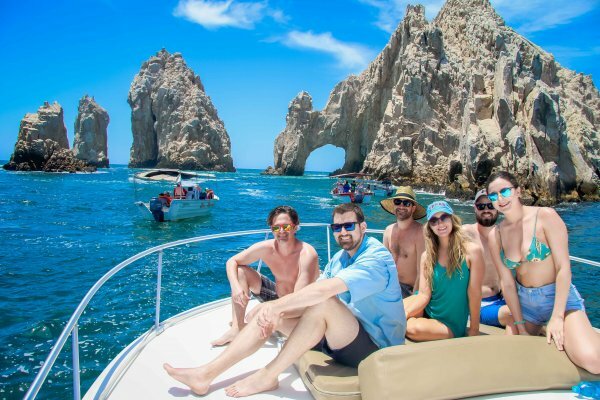 My friends and I went on a daytime cruise on the Blue Sky Cabo and it was amazing! Best party boat I’ve been on! The music was awesome, unlimited drinks and beers (crew was making them) and there was a stripper pole for when the drinks were really flowing! The crew blew up a floatation device that we nicknamed “party island” that can fit probably 12 or more people, so there were a few different parties going on. We floated just off of mango deck, and even took a water taxi into shore and back!